Lately the way I've been seeing the color blue has been like the way we typically see black- it's classic and wearable, dressed up or down. I know the proposed color of the year is supposed to be emerald, but I'm thinking blue is it for me. I'm ready to welcome back baby blues, and of course I'm drawn to cobalt blue (hel-lo, summer-perfect PS11) and steel blue (the pants look really dark, but in person they're a gorgeous blue-grey color). You guys have any preferred colors for the year? I love the blue, especially cobalt, i have the most amazing cobalt blue blazer!! your chambray top here is gorgeous on you! mine is defnitely ORANGE! <3 this blue on you. Love this! The beanie looks great. I agree, I've been back into baby blue! Totally regret getting rid of that color several years back, I guess you never really know when things will come back! I agree completely- I'm obsessing over navy tailoring at the moment and of course cobalt for the summer! So I guess I see all colors the way you see blue/ the rest of the world sees black: absolutely wearable! I have always been more of a red person but lately have been gravitating to all types of blue as well, so easy to wear! love these pictures. There's a particular shade of bright blue that I wear like black. It drives my boyfriend up the wall, he just doesn't understand why I wear so much of it! tailored blazer and button up buttoned to the top - completely into this right now. I've been loving robin egg blue lately. Such a gorgeous color. This outfit is great on you. Especially with your dark hair! Perfect! Simple with just the right amount of grunge!! Love this simple and so chic look!!! the bag is amazing! You look amazing; love the look. And your photos are of great quality. 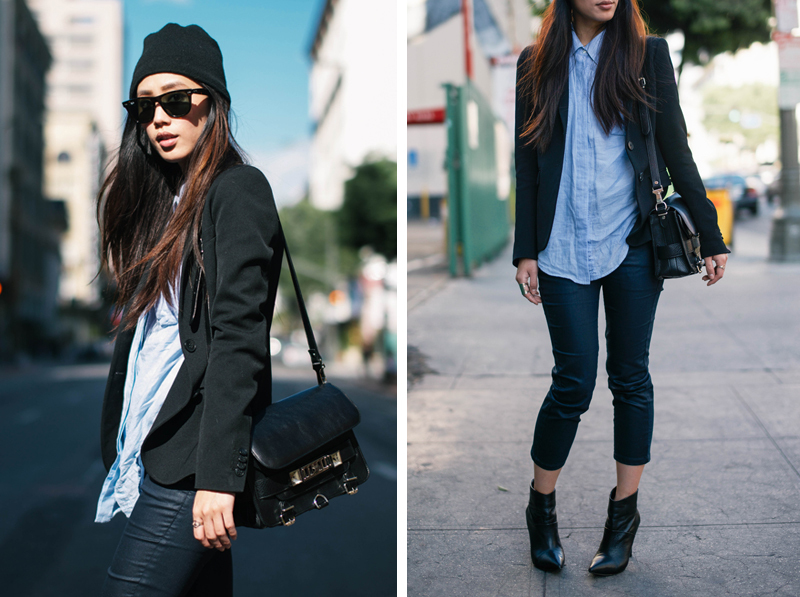 love the cropped pants with boots and how you used the baby blue instead of the expected white. 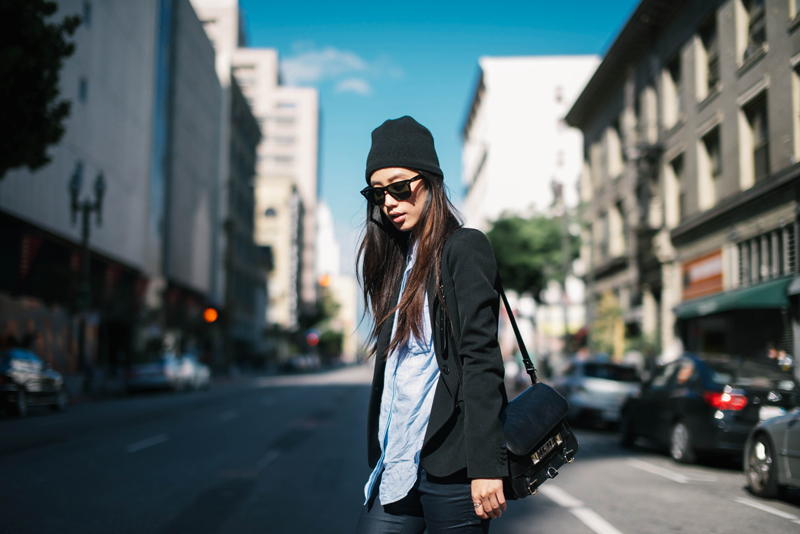 Absolutely love this cool-chic look. You have great style! Saw you on lookbook, now following you on bloglovin'. look forward to reading more of your posts! So simple, yet so chic! Love it! beautiful blog! maybe we can follow each other? Blue and yellow it is! Definitely 2 color I love most now. Nice look! I like your bag! Visit my blog too, new post up! Great look. Very rock 'n roll. 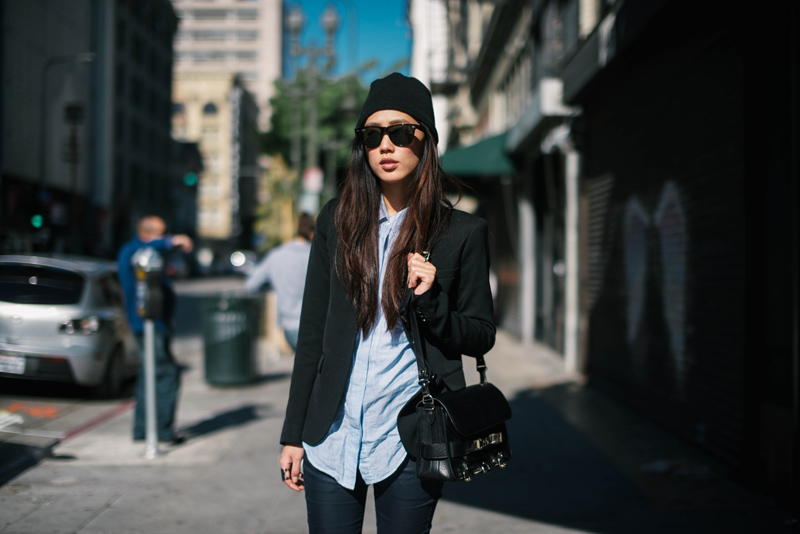 love this look, the chambray shirt is amazing! Another amazing outfit. I love how simple you are.